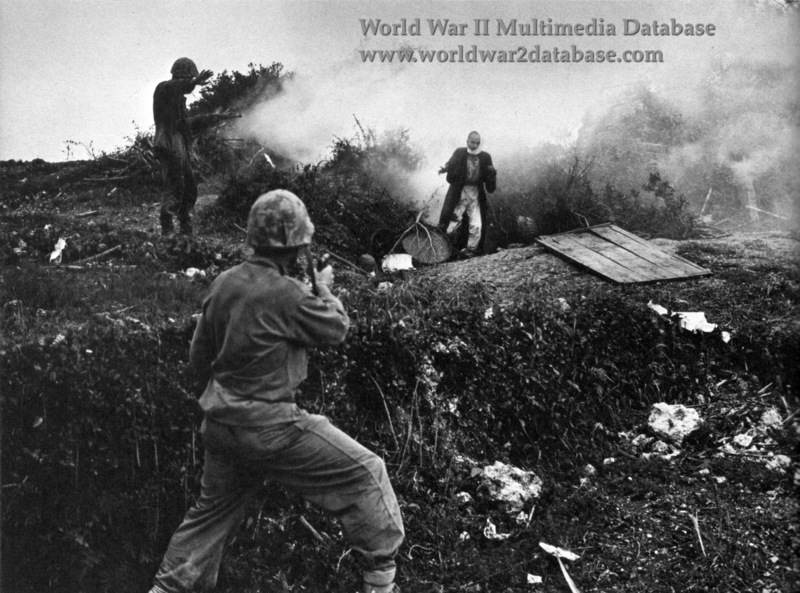 An Okinawan civilian is flushed from a cave by a smoke grenade. Many Okinawans sought the refuge of caves in which they could hide while the tide of battle passed over them. Unfortunately, a large number of caves were sealed when Marines suspected that they were harboring the enemy. Also, since many Okinawans were conscripted into defense units and issued military-style clothing, it was difficult for the Americans to identify friend from foe. Estimates of Okinawan casualties run as high as 110,000. Today, there is controversy in Japan between Okinawan survivors and right-wing Japanese over whether civilians were pushed into suicide by anti-American propaganda. Right-wing Japanese deny the Okinawans were issued weapons to take their own lives, while witnesses report orders to kill themselves with grenades when the invasion started.